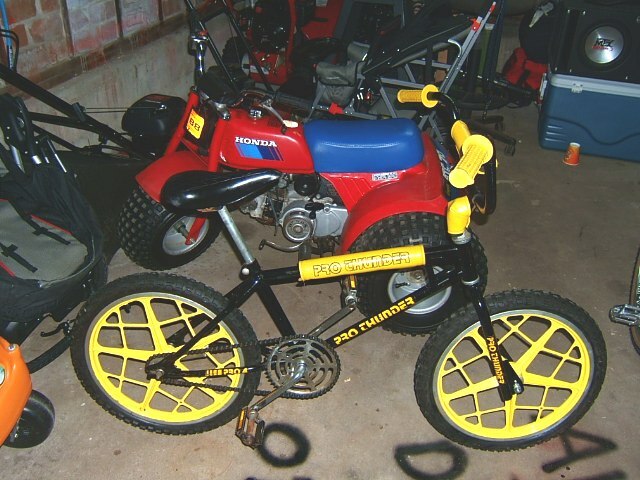 I had a Huffy ProThunder 4. The coolest BMX bike in the world of 1980. Shiny black & yellow bumblebee meets BMX, Baby! I loved to ride hard. I loved to jump. The stuff a BMX bike was made to do. The stuff boys frighten their Mamas doing. Jumping curbs was the thing to do on our neighborhood streets. The transition of curbing into each driveway made a pair of impromptu ramps--one in each direction--in front of every home. Jumping curbs. Again & again. Jumping curbs. Well, fun when you're a ten-year old boy. Years later as a newlywed my wife had a white Cutlass Supreme. Nothing too expensive, but the wheels & the trimwork gave it a tough, futuristic look. From the front it had the look of an old-school Star Wars Stormtrooper helmet. She never liked it when I said that & she still won't. Finishing up a late workday at my desk in Fort Worth & knowing Melanie would be leaving work in Dallas near 40 miles away, I got a cellular phone call. Noise. Sirens. My heart quickened. Then a firm voice. I'm an EMT with Dallas Fire Department. I've got your wife with me in the ambulance. She's been in an accident. We're taking her to Baylor Hospital. I'm not supposed to, but she wanted me to call you. I must confess that I broke the speed limit as I drove the very road my wife had wrecked on. I was only slowed by the onlookers gawking at what was left of her tough turned upside down white Cutlass Supreme. She'd been run off the interstate. Jumped a curb. Flipped her car. At highway speed. Not fun no matter your age. The ambulance ride & ER visit ended up being only precautionary. She came out sore, but with just one scratch & one good bump by God's grace. Matthew 5:17 records Jesus saying, "Do not think I have come to abolish the Law or the Prophets; I have not come to abolish them but to fulfill them." John R.W. (you know he's English because he has two middle initials & the way he spells "curb") Stott writes of that same biblical Law, "It is the kerbstone along the road of love." I can do the math on that equation: Law = Curb + Road = Life of Christ-follower. God's Law shows us our boundaries as we seek to follow Christ Jesus living by grace. As a kid jumping curbs was fun. A thrill. As an adult jumping curbs is costly. Possibly deadly. As a kid jumping curbs was habitual. It was daily. As an adult I try to keep it between the lines. Trouble free. But I must ask myself... When it comes to some of God's Laws for me--His commands, His direction, His will--am I still jumping the curbs? How does that reflect the growing maturity I should be attaining as a Follower of Jesus? Paul wrote in 1 Corinthians 13:11, "When I was a child, I talked like a child, I thought like a child, I reasoned like a child. When I became a man I put childish ways behind me."